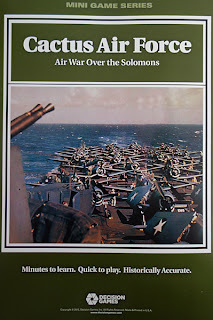 Battlefields and Warriors: Cactus Air Force: Air War Over the Solomons. 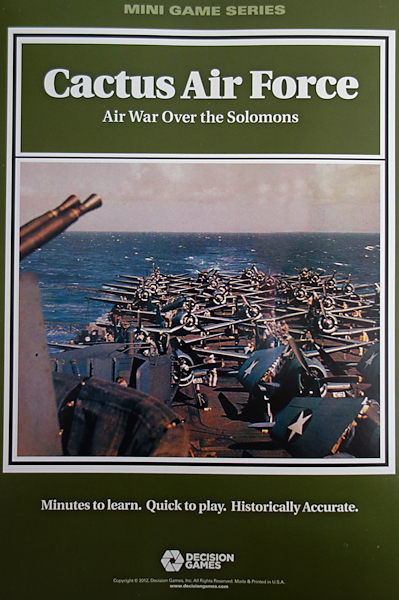 Cactus Air Force: Air War Over the Solomons. Cactus Air Force is part of the Air Wars mini-game series from Decision Games. 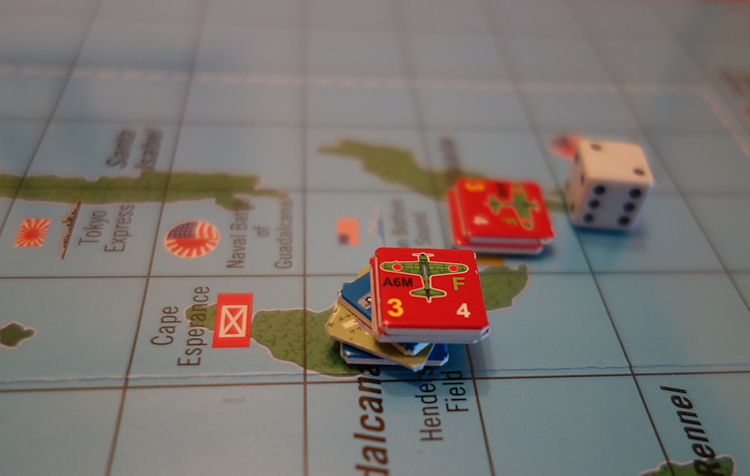 Game cover 9" x 6"
This post is a straight forward AAR of the game. For those who would like some more information about the system and sequence of play, I would refer you to an earlier post concerning the sister game ‘Eagle Day’ which pretty much covers that side of things (look under labels to the right of this text). Cactus Air Force is concerned with the air campaign over the Solomon Islands during the critical period late in 1942. This is a five turn game, just like Eagle Day, but here the turns each represent a month rather than a single day as they do in Eagle Day. Also the turn lengths are extended from 8 operational hours to 10 hours. Another notable difference between the two games is that here, one side (the Allies) have an advantage over the other in the quality of their fighters, giving them an extra ‘abort’ result in attack on a die roll of 4. 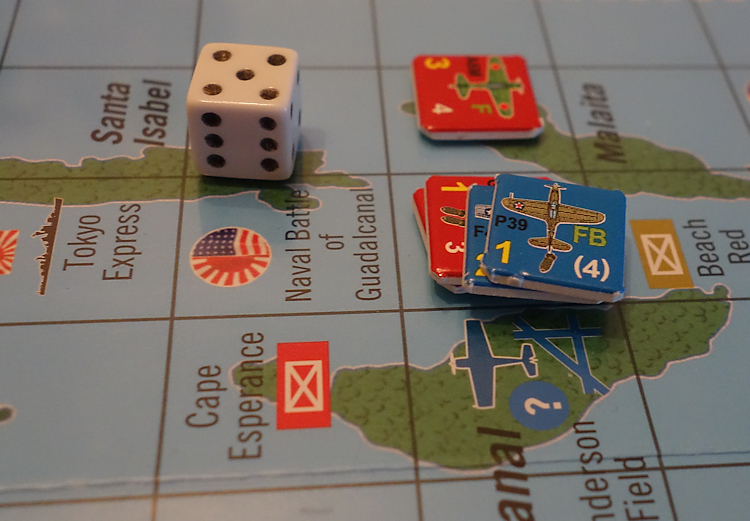 This essentially makes each die roll 17% more effective for the Allies, though numerically the Japanese are superior and their fighters actually roll more dice. Note 1 - there are only two combat results, Abort (sends the unit into the abort box) and Kill (sends the unit into the damaged box). The difference is that aborted units automatically return to play in the next turn, whereas damaged units will only return to play when a card allowing ‘refit’ is played. Units still in the damaged box at the end of play will count towards VP’s for the other side. These cards make their indicated targets available for attack. Note 2 - In addition to the standard targets that offer VP’s to the players when bombed, there are three targets that can only be attacked when their specific card is drawn (compulsory play) and then the window of opportunity to attack that target only exists for that turn and then the card is discarded from play, so during that turn, players will naturally make best efforts to attack that target. The three such targets are, Solomon Islands, Santa Cruz and Guadalcanal (area of the naval battle). 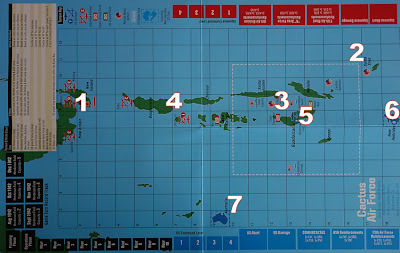 1 - Main Japanese airfields (Rabaul) and the Southeast Fleet. 2 - Santa Cruz, the Japanese can only reach it from their forward air bases (4). 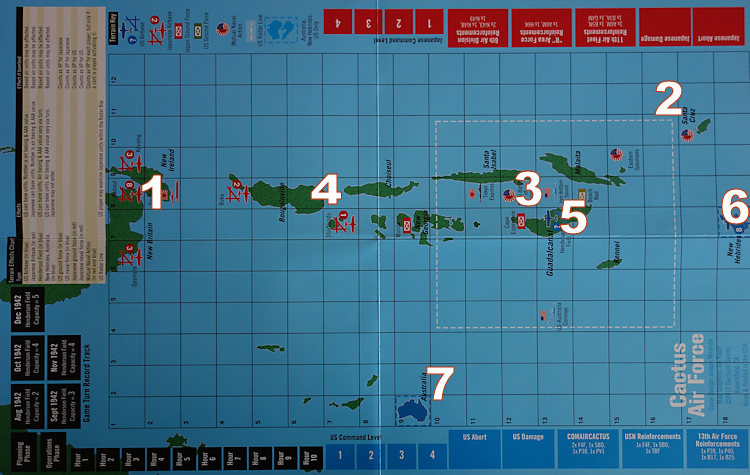 3 - This area contains the targets Tokyo express, Guadalcanal, Iron Bottom Sound and Beach Red. 4 - Forward Japanese air bases. 6 - New Hebrides, an Allied base that is essentially off map. 7 - Australia, an Allied base that is essentially off map. August 1942 (Henderson Field capacity 2). Planning Phase - The Japanese get two of their possible three reinforcement groups, while the Allies get just 1 one, giving the Japanese an immediate advantage. Operation Phases - Japanese targets are Beach Red and Iron Bottom Sound, while the Allies, who only have a weak presence at Henderson Field launch a small attack at Tokyo Express. The units making for Tokyo Express clash along the way with those Japanese units making for Beach Red, with the result that all those units leave the map (abort). Allied heavy bombers press on Munda (launched from Australia) and the threat brings a swift Japanese response. Both sides enter the air battle with 5 dice each, as these bombers are heavily armed. The B17 formation is turned away (aborted) but the B26 presses home the bombing attack, which fails. In turn the B26 is then lost (to the damaged box) following continued action with the Japanese fighters. September 1942 (Henderson Field capacity 3). Planning phase. The Japanese draw the 11th Air fleet as a reinforcement, so all of their forces are now in play. Their morale moves up to 4, meaning that they will be able to have a hand of four cards and stack up to four units. 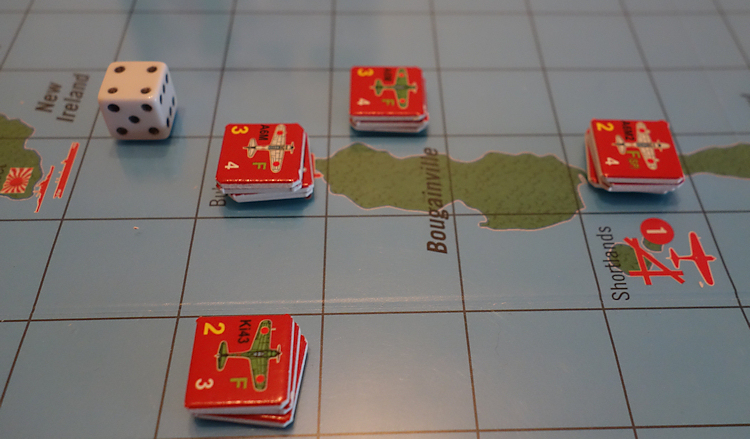 The Allied cards drawn this turn allow them to bring back their damaged air units. Operation Phases - The Japanese decide to target Beach Red (again) and the U.S. to Australia convoys. Both are successfully attacked. The Allies go for Munda (again) and also Cape Esperance. Additionally they launch a daring raid on the Southeast Fleet with B17’s and B26 Bombers. The raid is set upon by fighters, resulting in two kills, both the bomber units go into the damaged box. This feels like a real set back for the Allies. At Henderson Field, two Japanese bombers and one fighter unit engage the defending units. The Allies have one fighter unit airborne and two still down on the ground. As they enter air combat, each side inflicts 1 abort result on the other. Then the AA from the airfield attacks the Japanese, inflicting 1 loss (removal to the damaged box). Finally, the remaining bomber goes against the airfield and gets an abort result against one of the two units on the ground. October 1942 (Henderson Field capacity 4). Planning Phase - The Japanese continue to maintain full air strength. The Allied morale increases by 1 (going from 2 to 3) when they get the 13th Air Force as a reinforcement. Unfortunately, three Allied unit remain in the damaged box, so the disparity in the strengths of both sides remain. Operation Phases - As all the standard targets that the Japanese can score points against have been hit, they go into a defensive posture to defend Southeast Fleet, while sending off a small force to attack Henderson Field again (putting units caught there into the damaged box will gain VP’s). This force gets badly mauled by defending fighters as they approach Henderson Field and suffer two aborts and one kill result, leaving them nothing to bomb the airfield with. The Allied heavy bombers flying towards the Southeast Fleet is met by a very heavy fighter force, they are overwhelmed and destroyed - a fool hardy adventure considering the high numbers of Japanese units that were obviously in that area. November 1942 (Henderson Field capacity 4). Planning Phase - The overall situation does not look good for the Allies. 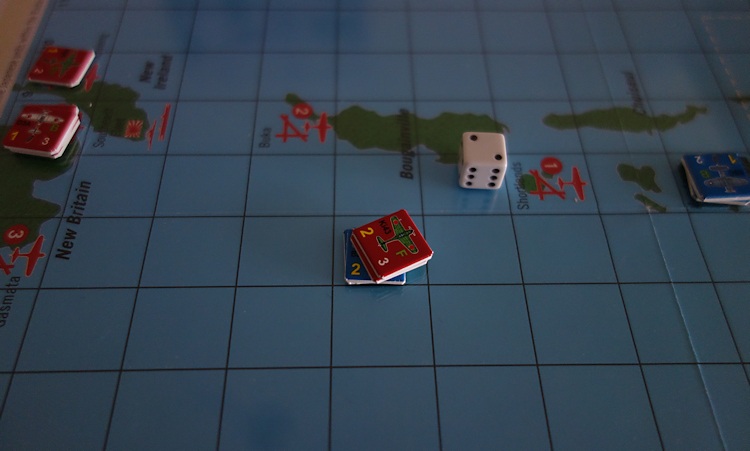 The Japanese draw the ‘Night of the Battleships’ card, which causes a free and compulsory attack against Henderson Field (roll a d6 for every air unit based there and remove it to the damaged box on a score of 1-4). The Allies consider themselves lucky to lose just one unit to this attack. They now have six units in the damaged box. For their part, the Allies draw the ‘Naval battle at Guadalcanal’ card and so the main objective for both players this turn is determined. 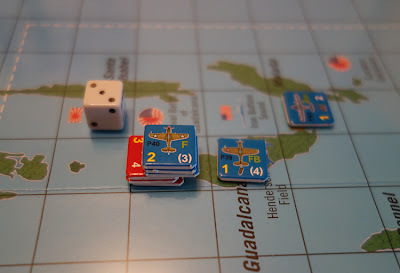 Operations Phases - Both sides successfully bomb the Guadalcanal objective, but with such strong Japanese forces in the area (overkill), those forces based at Henderson Airfield are forced to abandon the base and fly directly to New Hebrides, out of harms way. December 1942 (Henderson Field capacity 5). 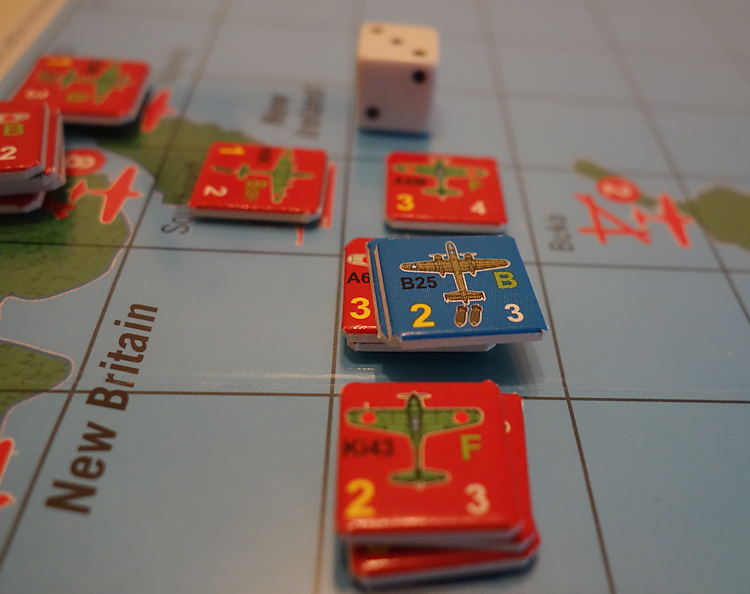 Planning Phase - The Allies get a precious ‘refit two air units’ card and choose to bring back their heavy bombers from the damaged box. 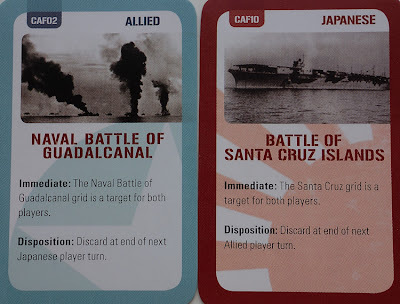 The Japanese draw the ‘Battle of Santa Cruz Island’ card, and so again this turn, the primary target for both players is determined, though it is a long reach for the Japanese from their bases. Operations Phases - The Japanese launch their attacks from their forward bases. The airfield capacity there is low, so they will only be able to create a single stack of two bombers, a fighter and a seaplane unit. The Allies can easily reach Santa Cruz (from New Hebrides) but crucially to them, they have so far failed to attack the Southeast Fleet and so they split their forces between these two targets. The heavy bombers leave Australia to attack the Southeast Fleet, while lighter bombers make the short journey to Santa Cruz. Japanese fighters break away from escorting duties to meet the heavy bombers and successfully deal with them. This ends any prospect of the Allies hitting the Southeast Fleet. 1 - Heavy Bombers from Australia, heading for Southeast Fleet. 2 - Japanese fighters break away from escorting to engage the bombers. 3 - Allied light bombers are already over Santa Cruz. 4 - Japanese group heading for Santa Cruz (they are 2 squares away from Iron Bottom Sound). As the lead Japanese group pass through Iron Bottom Sound, they are hit by fighters operating from Henderson Field and lose 2 units. However, they press on and still manage to make a successful attack against Santa Cruz. As the Allied fighters return to Henderson Field, the airbase is assailed by 3 light bombers. The airbase uses its AA (has a capacity of 5 now, so can roll 5d6) but only defeats one of the attackers. The bombing attack hits the units on the ground and another Allied air unit goes into the damaged box. The final turn has been played and the game ends. Victory points are assessed, with 25 going to the Japanese side and just 21 to the Allied side (if only they add got the Southeast Fleet, they would have had an extra 4 VP’s) . The difference of +4 in the Japanese favour gives them an Operational Victory. Significant points of note in this game were 1) the Allies did not manage to hit the Southeast Fleet. 2) the Comaircactus reinforcements were not released to the Allies. 3) the Battle for East Solomon card was not drawn. Had one or more of those possibilities occurred, then the outcome may have been different. Solitaire - It is described as a two player game, though the solitaire rating on the back of the package gives it 4 stars out of 5 for solitaire playability. I played the above replay solitaire without any difficulty. You lose the radar aspect of the game and the secrecy of moving units around hidden (flipped), but that is quite a minor issue and really the handling of inverted counters (for fog of war) is something that I will happily miss. Complexity - Described on the package as ‘very low’ and graded as one star out of 5. There are 4 pages of series rules and then 1 page of scenario rules, including set-up instructions. It makes for an easy read, though I think you need to play a practice opening turn to help embed the rules and more importantly, understand the practicalities of how to best use your forces. Size - As with the other games in the mini series, the map is 11" x 17" and there are just 40 counters. The cards are two and a half inches deep, there being only 18 of them in the game. This really is a compact game and is ideal for the desk top or as a travel game for a vacation. Time - The package says 1 - 2 hours. I would say just under 2 hours sounds about right. Set-up takes less than 10 minutes. The game cost £11 in the UK (June 2013) and represents good gaming value. The games are essentially errata and problem free and give some fun gaming. I enjoyed the sister game, Eagle Day and I like this game as well. It is surprising just how well the system can telescope between daily turns (ED) to monthly turns (CAF). The Japanese fighters in this game are given the capability of Long Range Aircraft, meaning they can stay airborne over the full 10 Operational Turns. I assume this is representing the ability of carriers to project air power across a wide expanse. That is a clever abstraction, allowing the system to be stretched and still stay stable. The cards and the geography give the game a different feel to Eagle Days, so the system stays fresh and owning both is worthwhile. The cards seem to have a bigger impact in this game as they govern reinforcements and act as gateways to attacking targets that will not be available on other turns. So the question of when (or if) these cards will be drawn certainly adds uncertainty to the game and gives replay value. Each force offers a different feel, so again, it is engaging to explore the best way to handle each side, helping replay value. I’m looking forward to the next release. Another excellent AAR Norm. What would you say about replayability of this game and Eagle Day? Are there different scenarios or do the event cards make each game different from the last? Hi Dave, There is a single scenario in each game and the cards allow a few historic events to make an appearance but there are only 9 cards per player, so when you play the historic event card, it is discarded, leaving even less cards for that player to re-cycle, so the opportunity for the cards to greatly change the direction of games is a little limited. 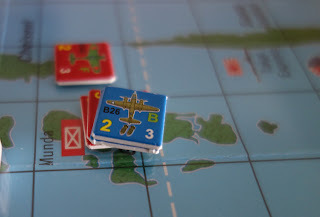 Of the two, I think CAF may have more replayability because actual air strengths are reliant upon getting the reinforcement cards into your hands. Both are fun to play and because they are so easy to get into and quick to play, there is a temptation to play them several times over anyway (if only to explore what else might crop up) before moving onto to another game, so I think considering their price (£11) and accessibility, they are a success. I will take one away with me next time I am away from home. OK thanks. It does seem that they would make ideal "travel" games due to the minimal space needed and the quick set-up and play. Are you going to try out any ww2/modern land combat games in this series? I have Golan in the larger folio format, which I would like to try. I will do Loos 1915 first, it will be interesting to see how the rules travel that time gap. Do you mean the rules from the folio series are common for Golan and Loos? So there must be a game specific rule set as well. I know DG (the company, not me:)) has/is producing updates to original SPI games so is it correct to say Golan is based on the original SPI game in Modern Battles I quad game set? I loved those SPI games back in the day and I wonder what difference the updates provide so I look forward to your Golan AAR/review in the future. My Golan and Showdown game have the same core rules (each has an additional 4 page game specific ruleset that also includes set-up etc) and these are referred to as Version4. The Loos is likewise equipped, though that set is called version 5F and the back of the folder describes it as a modified version of the 'Fire and Movement' system. So there must be some changes, but I will need to give them more than a superficial glance to know what that means exactly.